Due to the rising fossil fuel prices alternative solutions for energy needs are sought. One of these alternatives may be biomass boilers. And within the existing technologies for obtaining energy from biomass, there are torsional chamber biomass boilers. 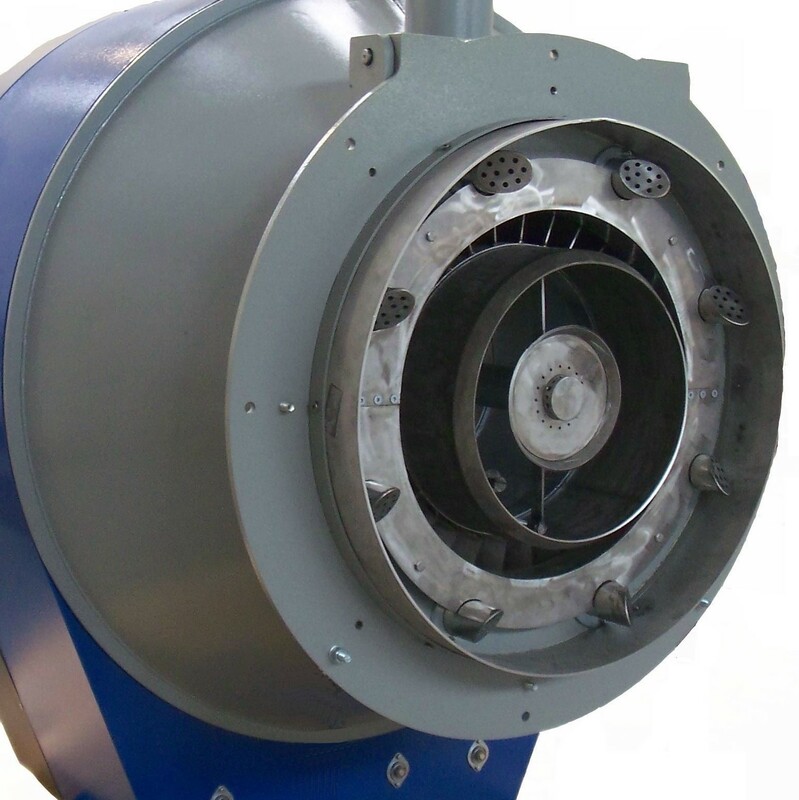 In this article we explain how it works our retractable combustion heads for biomass boilers. 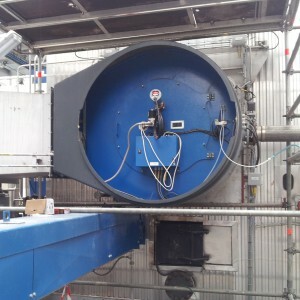 E&M Combustion has developed a 40 MW natural Gas Burner to be coupled to a 45 t/h torsional chamber in a biomass boiler running on sunflower seed hull. The burner developed by E&M Combustion is a fully functioning model and is already installed in the sunflower oil pressing and refining plant of the Saipol company, in the Bassens plant in France. 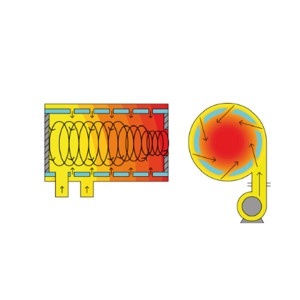 The Torsional Chamber is a horizontal cylinder connected to the boiler via an inverted conical collar. Within same, the potential field created by the tangential injection of air along throughout the periphery of the cylindrical chamber induces a rotational axial field in reaction to the above. Whilst the tangential velocity of the potential field increases with the decrease of the radius, the tangential velocity of the induced rotational current increases with the radius; which are equal, a very active and turbulent boundary limit is formed, which maintains an intense combustion under the most favourable conditions. The fuel particles are also injected tangentially into the cylinder. Those located in the potential field capable of flowing towards the centre follow a logarithmic spiral trajectory; those subjected to the rotational field will follow an arithmetic spiral trajectory. Introducing a constraint at the end of the cylinder (conical collar), the pressure created in the throat ring generates axial forces, and the dynamics of the system is such, that the particles reach the end of the combustion chamber, outside the chamber’s outlet diameter, follow a helical trajectory in the periphery of the cylinder throat, returning back to the front continuing in increasingly smaller diameter impellers , and finally exiting the chamber via the throat, in an even smaller helical trajectory. This path implies that a longer spent time is required to ensure complete combustion. This longer spent time of the particles can be up to 60 times longer that than which carries direct air flow. Simultaneously, the combustion fumes, with a portion of the ashes, exit the chamber via its collar and enters the boiler, whilst the ash residues are regularly removed from the torsional chamber. 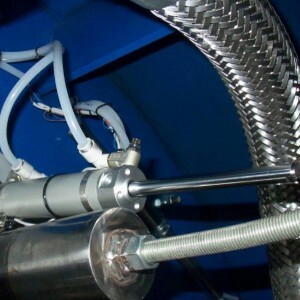 The Torsional Chamber is suitable for the burning of any type of solid or liquid fuels, whenever they can be transported in pneumatic suspension. The suspension capacity of the fuel depends of the density/average normal section ratio, but for various biomass types, this broadly means that the particles should be of a diameter of between 0.1 and 20 mm. There is no limitation to burn particles of very different sizes or densities, as long as they can all be kept in suspension. Fuels with humidity less than 20% can be injected directly into the torsional chamber without the need for prior treatment. It is also not necessary to preheat the combustion air, which makes it advantageous to obtain a very low NOx production. Some typical fuels are: sawdust, sanding dust, sunflower seed and cottonseed hulls, grape seed, olive pomace, straw etc. As in most biomass facilities, due to reliability issues, require the backup of a conventional combustion boiler. 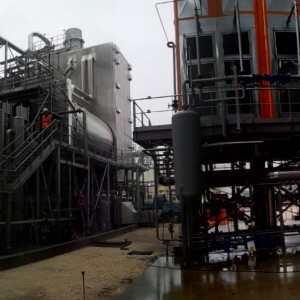 E&M Combustión has developed a 40 MW natural gas burner to be coupled to a 45 t/h torsional chamber biomass boiler of the Berkes company running on sunflower seed hull. At the customer’s request, it is required that the burner can function both single-handedly as well as backup of the biomass, furthermore its commissioning must be fast, a maximum of 2-3 minutes from the its operating demand. The burner is directly fastened onto the torsional chamber, reason why it would require continuous fan operation so as to ensure that there is no flashback and for the internal cooling of the burner. It was noted that this constant air flow through the burner affected the normal operation of the torsional chamber and therefore was not feasible. The solution to assemble and disassemble the burner each time that is was required to do so was not feasible due to reliability issues and because the time required for such operation was not compatible with the maximum commissioning time of the burner. Given the impossibility of removing the entire burner from the combustion chamber, it was decided to search for a system wherein both the burner as well as the combustion fan and the gas ramp could burn fastened to the chamber and only if the retractable combustion heads are removed. Finally it was decided to design a burner wherein the retractable combustion heads could be removed pneumatically outside the combustion chamber to later lower a guillotine which isolated the burner from the combustion chamber. The guillotine opening operations, insertion of the combustion head and commissioning of the burner only takes a couple of minutes to do so. A pneumatic cylinder with two limit switches, are responsible for moving the gas lances and to indicate its position to the BMS so as to proceed with the operation of the guillotine and commissioning of the burner. • As it is not necessary to have the fan continuously running thus achieving that the normal operation of the torsional chamber is not affected. • Electrical savings as it is not necessary to have a fan continuously running fan for cooling the burner. • Mechanical reliability by not having to remove the burner or fan or air duct or gas ramp whenever wishing to switch on or remove the burner. • Quick commissioning of the burner as need whether due to a breakdown in the biomass system or due to the need to supplement the power supplied by the biomass. • Option of using the burner to start up the biomass boiler. • It is possible to replace or repair any element of the burner with the biomass boiler running.